From the hitherto unsafe cocoons of industrialised nations and their legendary dalliance with turbulence of every hue, climate change has burst forth on African shores with a sneeze that is reminiscent of asthmatic baboons in virgin forests. What was once considered the exclusive preserve of those who engage cosmic forces through technological advancements has predictably navigated its way to the African corridor. From Kampala to Kinshasa, from Nouakchott to N’Djamena, from Lagos to Lusaka, climate change is increasingly becoming real with alarming greenhouse gas levels, frenetic rise in temperatures, astounding biodiversity losses, unmatchable sea level rise, flooding, drought, deforestation and desertification. With this barefaced reality comes an African media that is seemingly bogged down by the fear of factual and narrative challenges as well as distortions of balance bordering on inadequate comprehension of climate change terminologies, unmistakable absence of editorial support, and obsolete media tools and resources. There is no gainsaying the obvious that the above largely contributes to the poor coverage of climate change issues in this continent that is likely to be impacted acutely. In view of the fact that climate change is and will continue to be one of the most important global issues confronting mankind, the African media space cannot afford to relegate it to the backburner as the attendant consequences of ignorance, general public misunderstanding of both the science and the policy implications of climate change will be too grievous for the populace especially the rural communities who are most vulnerable. For a safer African climate, there is a great need to engage media constructively with a view to opening vistas of effective collaboration between the government, civil society, faith-based organisations, and cultural bodies. A mix of all these elements in the media will go along way in promoting environmental sustainability in Africa. Governments at all levels must recognise and partner with the media to drive home mitigation and adaptation measures as well as set the agenda for climate justice for Africa at international negotiation tables. The declining status of media coverage of the African climate is an invitation for more innovative ways by which the costs associated with climate change coverage can be shared and defrayed. It needs to attract true partners within the media sector and beyond in addressing climate change issues and it must develop practical solutions to overcoming the systemic public apathy toward climate science and climate science journalism in Africa. Perhaps, it is in recognition of the aforesaid issues of urgent continental importance that the Pan-African Climate Justice Alliance (PACJA), a leading continental coalition of 500 civil society organisations in 43 African countries, took the initiative of calling Journalists from across the continent to a workshop in Nairobi on the way forward for African climate reportage. Suffice it to add that this workshop eventually gave birth to the Pan-African Media Alliance for Climate Change (PAMACC) which aspires to tell the African climate story in a refreshingly lucid, communally engaging and technically robust manner as never seen before on the continent. The PAMACC idea, if effectively mobilised on the time-tested ideals of African brotherhood, which runs on the wheels of regional and cultural linkages, may usher Africa into the future, an era of environmental consciousness and concerted actions. As PACJA continues to strengthen its strategic engagement with the African media through PAMACC, it is hoped that the capacity of African Journalists to effectively cover a full range of climate change issues such as the African climate justice agenda, mitigation and adaptation, technology transfer, climate finance and negotiations would be greatly enhanced. These have become absolute necessities, as Africa is the least contributor to greenhouse gas emissions that are increasingly making our climate unsafe. As PAMACC’s energy-efficient engine roars to life across the continent through its strong networking credentials, may the green information it emits and the development it engenders blow from Cape Town to Cairo and from Blantyre to Bujumbura, sweeping away, deforestation and old farming methods that contribute to climate change and bringing better and renewable farming methods to feed a greener Africa! May PAMACC rise above the failures of past attempts at continental affirmation and showcase African success stories in climate change adaptation and mitigation with a view to replicating these initiatives in all African villages and communities. 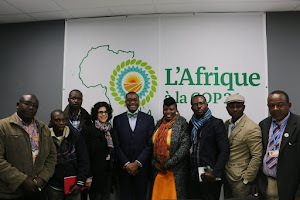 Whilst holding governments and multinational corporations to international best practices in oil and gas exploration with zero-tolerance for oil spillage and gas flaring in African communities, it is hoped that PAMACC will trumpet demands for technology transfer from developed countries to Africa as well as local capacity building and the creation of a $200 billion fund to assist African countries in mitigating against the impacts of climate change. The new media alliance must lead advocacy efforts at ensuring that developed countries cut emissions to at least 40% below the 1990 levels. As the new media alliance berths, it is believed that Africa is on the threshold of significant and constructive change for the betterment of all her inhabitants, including animals, trees and plants. If we take this opportunity to work together, we would in unison bear true witness to the great and miraculous change that will take place in our continent. At this point, it takes all the media efforts, CSOs, governments and the private sector to get involved. The time has come for us to change, evolve, grow and stand tall for our environment. Together, let us make the unprecedented leap to the green era of sustainability that awaits us.